DSC_0024.JPG, originally uploaded by michael_jecks. Of course, once Folk Festival was over, I had to go to have my latest acquisition fixed. Ah. Yes. Not only do I have a Bodhran and melodeon which I can only play in a rudimentary manner, now I’ve a fiddle too. And it was a pleasing little machine when I got it for the grand old sum of Â£30 (thanks, Annie!). My neighbour was throwing out all excess things, you see, and mentioned to me that she had a fiddle she’d hardly used, and I offered to equal anything the professional proposed for it . . . but she accepted an offer of half what he asked, which I think was rather sporting. Less sporting was the fact that my (astonishingly still alive) son kicked it (ok, it was an accident, but still) and dislodged the sound-post. My fiddle developed a rattle. So this morning I had to pack it up and drive it to an expert violin-mender in Chudleigh, Martin Vosloo, who fixed it for me. Not only that, he tuned it, set up the bridge, the lot – and then refused any sensible remuneration. A very pleasant and kind gentlemen. But, on the way home it occurred to me that I hadn’t taken many moorland shots recently. So since I had my camera, I stopped a couple of times to take some. It seems that the photos are doing some good, too. Other people quite like some of them. Yesterday we had the Sticklepath Flower Show, and I won a first, a second, and a third prize in their photo competitions. Most satisfying! « Sadly, the end . . . 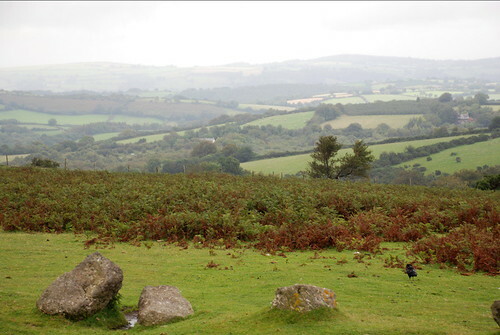 This entry was posted on Sunday, August 19th, 2007 at 10:28 pm	and is filed under Dartmoor. You can follow any responses to this entry through the RSS 2.0 feed. Both comments and pings are currently closed.